I love the creamy pastas, and for a long time after going vegan I thought it meant I wouldn't be able to enjoy "creamy" anything. But I quickly learned there are ways around the standard methods of making a creamy dish, you just have to get a little creative! Vegan cheese is definitely a luxury that I don't always keep in my fridge - though I wish I could. I've also been trying to eat cleaner lately, sticking to mostly vegetables, fruits, and whole grains, but every once in a while I just need something that isn't a plant, you know? This pasta is creamy, cheesy, but also tangy and fresh. 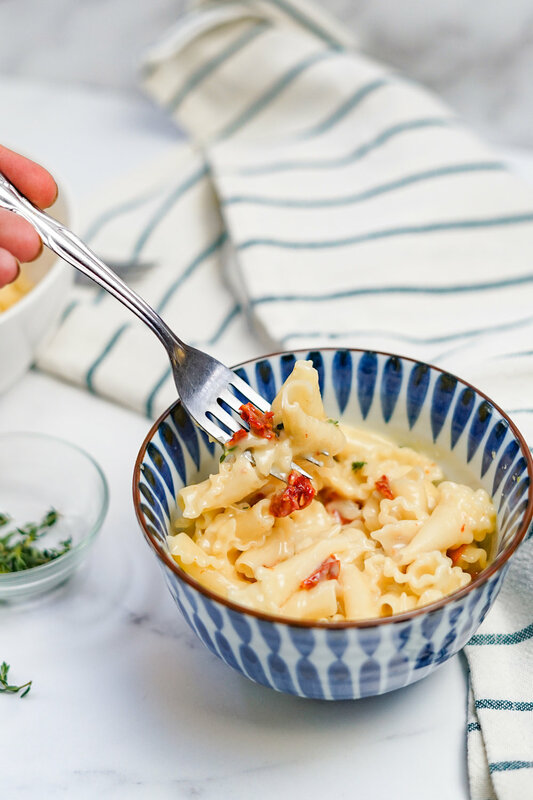 This comes from the sun dried tomatoes but also the white wine I added to help thin the cheese sauce - both of these are in my 10 Kitchen Staples to Step Up Your Game post with eight other great ingredients you should keep in your pantry! If you're wondering what "gigli" is it's simply a type of pasta comparable to campanelle, which means "bells" in Italian. They get this name from their delicate bell-like shape, with a wide, flared mouth at one end and a much smaller, tapered one on the other. I bought mine from Trader Joe's but you can find gigli or campanelle at pretty much any grocery store. Although I have yet to find a gluten-free version, if you do find one and substitute it in this recipe, it will be fully gluten free! When the sauce is the main focus of a dish, you want to be deliberate in the noodle you choose. I chose the gigli because the "ruffles" on the wide mouth end coupled with the noodle being rolled allowed the sauce to get caught inside the pasta. If you were to use linguine, you'd be left with a blob of cheese sauce at the bottom of your bowl, not in your belly where it should be. I've been making this every few weeks since Chicago's weather is refusing to warm up despite being mid-April. I love making this on nights that are extra cold but I don't feel like spending much time in the kitchen. Within 15-20 minutes, I have a cheesy pasta meal ready for me (and probably a glass of wine). If you want to make this dish have at least some nutritional value, I'd recommend adding Italian sausage for extra protein! I love Tofurkey and Field Roast's versions. Over medium high heat, boil a medium sized pot of water with a sprinkle of salt added. While the water begins to boil, cube your cheese and chop the sun dried tomatoes. In a small to medium sized sauce pan, add the 1/2 tbsp of coconut oil over medium heat allowing it to melt and coat the pan. This will help prevent the cheese from sticking to the pan. At this point your water should be boiling. Add the 2 cups of gigli pasta, stirring occasionally to prevent the noodles from clumping and to help evenly cook them. Once the coconut oil has fully melted, slowly add all your cheese to the pan, constantly stirring to prevent burning. Once the batch of cheese you've just added has melted, add more cheese, until all your cheese is in the pan and melted. Don't forget to give your pasta another stir! Fold the fresh thyme leaves and sun dried tomatoes into the cheese mixture, lowering the heat to medium low. At this point, add the 2 tbsp of Pinot Grigio, plus the pinch of salt and pepper, gently stirring it into the sauce. Remove from heat but keep covered. Your pasta should be done cooking now. Strain the pasta in a sink and place back into the pot. Immediately add the cheese sauce to the pasta and toss to evenly coat the noodles.